Bloom with intensity and yellow brilliance demonstrating the magic of Mother Nature. Since the dawn of time, Ecuador has been related to nature. When you travel around Ecuador you will find an abundance of butterflies, gathering of fishes or this amazing tree called Guayacan. At the South end of the country, you will find 5,000 square foot of an incredible natural setting for this tree, “Los Bosques de Guayacan” a forest that is still intact. Next to this wonder of nature, you will find so many different areas that are full of wildlife, botanical plants and exotic trees, so many species that have not yet been discovered by modern scientists. Guayacan, a tree that stands out at in Ecuador due to its stunning beauty. The botanical name is Tabebuia guayacan (Bignoniaceae). You would find it everywhere in Ecuador, but especially appreciate all its flowering beauty at this untouched forest site located at this small touristic town Mangahurco in the Province of Loja. Many flowers appear on still leafless stems at the end of the dry season, making the floral display more conspicuous. 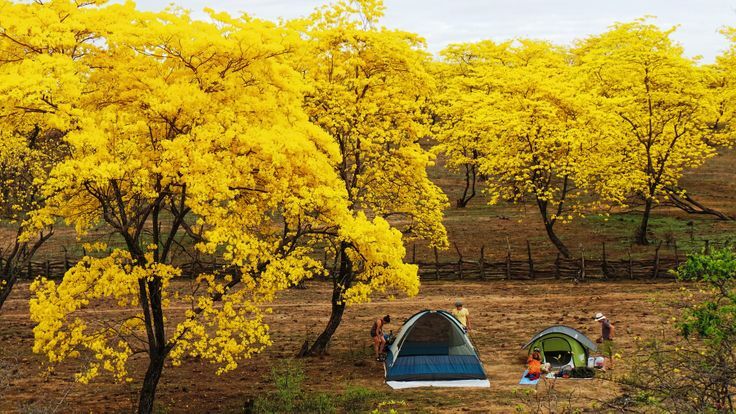 The Guayacan Tree usually produces big yellow flowers by end of January with the first rains at the end of the dry season. It is a notable flowering tree. The flowers are 1 to 4 inches wide and are produced in dense clusters. Corolla colors vary between species ranging from white, light pink, yellow, lavender, magenta, or red. They are useful as honey plants for bees, and are popular with certain hummingbirds. The Guayacan is not only beautiful but also offers relief for several health problems. Tea made from the flowers treats urine and kidney trouble. The flower tea has also been used to treat tuberculosis in Latin America. Promoting touristic sites of this tree in Ecuador will help so much to prevent deforestation of this species. Guayacan’s wood has high local commercial demand, reason why Guayacan deforestation needs to be managed and control. If locals are able to obtain an income from touristic harmless resources like this one, changes will happen through time, and we will see less damage down to Mother Nature. Ecuador News & Travel, Inside scope, property listings, key ready packs, plus free services, proven honest local references, and how to avoid getting “overcharge” while in Ecuador. Posted on January 31, 2014, in Ecuador your new spot to live or retire, Ecuadort Travel, HOME and tagged Biodiversity, Bird watching in Ecuador, ecological, Ecuador, Ecuador Forests, Ecuador Tourism, Ecuador travel, Latin America, Loja, natural environments, Nature Ecuador, offering tours, retire, retiring, South America, travel, Travel Ecuador, visiting Ecuador, yellow flowers. Bookmark the permalink. Leave a comment.